The FollowMee GPS tracking mobile app converts your Android, iOS, or Windows device into a GPS tracking device. Installing this app to devices that you want to track, you can monitor their whereabouts on this web site. Use the following steps to start tracking your family or company devices. Watch video here. You don't need the mobile app for monitoring location. Simply login to this web site in your web browser. 3-day history is maintained for the paid app and current location for the free app. Extended history ranged from 14-day to 3-year is available for subscription. You can track unlimited number of devices in your account. For family tracking, you should use the same account for all your devices. 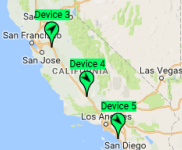 In this way, all your devices are on the same map. Our GPS tracking mobile app supports iOS, Android, Windows, and Blackberry. We don't serve ad on this web site or in the mobile app. We don't sell your geolocation data. You can share your live location through a URL. You can embed the live map on your web site if you subscribe to Web Service API. For sharing with limited users, you can use delegate account. You will receive notification email when your device enters/exits the geofence. Use this function to alert you when your child arrives in school or comes home. Geofence can be set up on the map page. You can download your tracks in CSV (Excel), KML, GPX format on the map page. Mileage option is available. You can use this GPS tracking mobile app and our premium services to record your state residency status. Enable a full-time tracking device setting in the mobile app. Tracking starts when the vehicle is driven, and pauses when it is stopped. This feature is only available for the Deluxe Edition. You can track unlimited number of devices in your account. For business tracking, you should use the same account for all your devices. In this way, all your devices are on the same map. You can group your devices in your account. Then you can view the location map by group, or allow other users to view your group of devices. By adding other FollowMee user as your delegating account, you allow this user to view your device location. This feature together with grouping devices enable your sales manager account to view only devices of the sales group, and your maintenance manager account to view only devices of the maintenance group. Login token allows your employees to set up the GPS tracking mobile app without exposing your account credential. iOS users can use MDM to push the login token to the devices to simplify your set up. You can download your tracks in CSV (Excel), KML, GPX format on the map page. Mileage option is available. You can use this feature for your time tracking. You can embed your live map on your business web site. Option is available to use your company icon on the map, and to customize the infobox to include driving directory, contact information, etc. Web Service API returns data in JSON or KML format, enabling you to feed data to your own application, or provide your own mapping solution. For API documentation, see this page. You can use the geofence function to record your employee's entry and exit time of the project site. We offer Account Level Geofence service to enable easy setup and modification of your business wide geofences. Test drive our service with the demo account. Login manually with demo99 as user name, demo99 as password. Or use this link to login automatically. Stealth mode for Android app no longer available. More.. Important price model change. More..
Use FollowMee to track Santa. More..
New version v5.0 for iOS. More.. Paid app will change to 3-day history for all users. More..